Using Confocal Laser Scanning Microscopy, scientists have imaged fossilized pollen grains from Northern Switzerland that dates the evolution of flowering plants to the early Triassic Period around 252 to 247 million years ago. The three dimensional high resolution images of six different types of pollen also suggest that the plants were pollinated by insects. The Triassic period extends to about 250 to 200 million years ago and is the first period of the Mesozoic Era. This period lies between the Permian and Jurassic periods. During the Triassic period, the Earth's climate was generally hot and dry and that there are no evidence of glaciers at or near the north and south pole. During this time, the polar regions were moist and temperate. It would have a climate that is suitable for forests and vertebrarates. The Earth's continents would not have existed then. The land mass of the planet then was one gigantic continent called Pangea. The climate on Pangea was seasonal having hot summers and cold winters. Plant life during this time was believed to include lycophytes, cycads, ginkgophyta (represented in modern times by Ginkgo biloba) and glossopterids. Seed plants such as spermatophytes are abundant in the north while Glossopteris (a seed fern) was the dominant tree in the southern hemisphere. 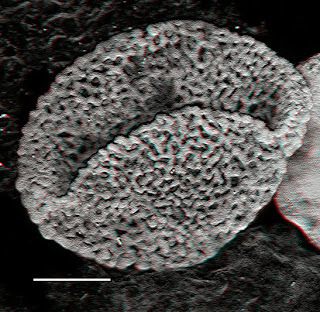 The discovery of the pollen would place the appearance of flowering plants during this period, 100 million years earlier than previously believed. Drilling cores from Switzerland have revealed the oldest known fossils of the direct ancestors of flowering plants. These beautifully preserved 240-million-year-old pollen grains are evidence that flowering plants evolved 100 million years earlier than previously thought, according to a new study in the open-access journal Frontiers in Plant Science. Many studies have tried to estimate the age of flowering plants from molecular data, but so far no consensus has been reached. Depending on dataset and method, these estimates range from the Triassic to the Cretaceous. Molecular estimates typically need to be "anchored" in fossil evidence, but extremely old fossils were not available for flowering plants. That is why the present finding of flower-like pollen from the Triassic is significant, according to the team of researchers who made the discovery. Peter Hochuli and Susanne Feist-Burkhardt from the University of Zürich studied two drilling cores from Weiach and Leuggern, northern Switzerland, and found pollen grains that resemble fossil pollen from the earliest known flowering plants. With Confocal Laser Scanning Microscopy, they obtained high-resolution images across three dimensions of six different types of pollen. In a previous study from 2004, Hochuli and Feist-Burkhardt documented different, but clearly related flowering-plant-like pollen from the Middle Triassic in cores from the Barents Sea, south of Spitsbergen. The samples from the present study were found 3000 km south of the previous site. The authors believe that even highly cautious scientists will now be convinced that flowering plants evolved long before the Cretaceous. What might these primitive flowering plants have looked like? In the Middle Triassic, both the Barents Sea and Switzerland lay in the subtropics, but the area of Switzerland was much drier than the region of the Barents Sea. This implies that these plants occurred across a broad ecological range. The pollen's structure suggests that the plants were pollinated by insects: most likely beetles, as bees would not evolve for another 100 million years.